Learning jazz is all about learning colorful four note chords that expand on the typical three note chords we hear in modern, everyday music. Playing jazz chords will give you an opportunity to expand your knowledge of music while simultaneously training your ear to be able to listen to music with greater depth. In this exercise, you will learn how to play the three chords used to create what is called a 2-5-1 chord progression. Sit down with the guitar whatever way is most comfortable. The string that is on top of all the other strings should be the thickest string on your guitar. This string is called the “Low E String”. Going down the strings from the Low E String we have the strings A, D, G, B, and the high E string. Find a tuner online that plays the frequency of each string. Use your knowledge of the string names to match the frequency of your strings with the frequency of your tuner. 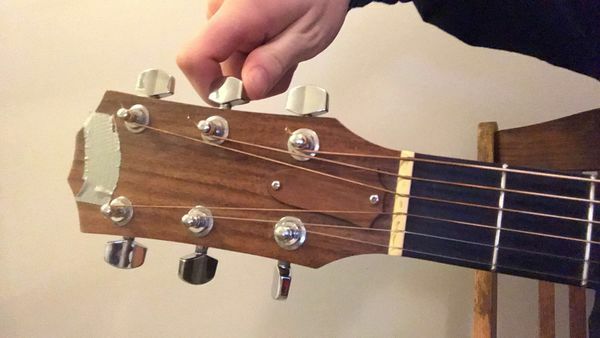 Do this by playing each string individually and turning the tuning pegs until the sound you hear coming from your guitar matches the sound you hear coming from your online tuner. If you have your own tuner, follow that tuners specific instructions to get your guitar in tune. In this part, you will be only visualizing the chords in this progression and not playing them. The chord diagram above shows where to put your fingers in order to play a C minor 7 chord, the first chord in the progression. Notice that there are six vertical lines on the diagram. These lines correspond to the strings on the guitar with the low E string on the far left and high E string on the far right. The “frets” in the diagram are the spaces between the horizontal line and indicate the spaces between the metal dividers on the neck of your guitar. 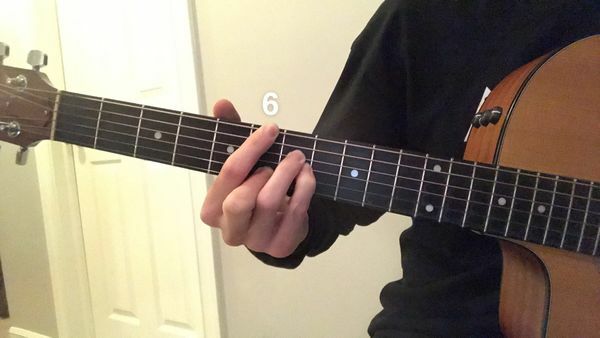 The numbers at the bottom correspond to the number of which finger you need to place on that particular fret; however, you may use the fingers you feel most comfortable with as long as you can hear all of the strings. The multiple x symbols at the bottom of the chart indicate that you should not let that string make any sound when you play the chord in future steps. Finger numbers are as follows: 1 = Pointer Finger. 2 = Middle Finger. 3 = Ring Finger. 4 = Pinky. 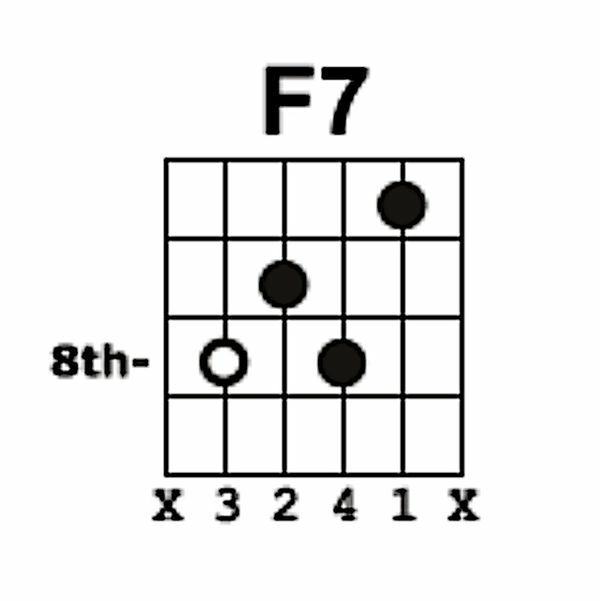 Reading an F7 chord diagram is the same as reading a C minor 7 chord diagram. 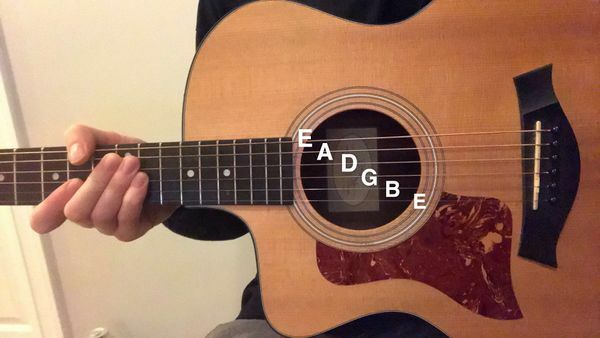 Notice that you are no longer placing any fingers on the low E string. 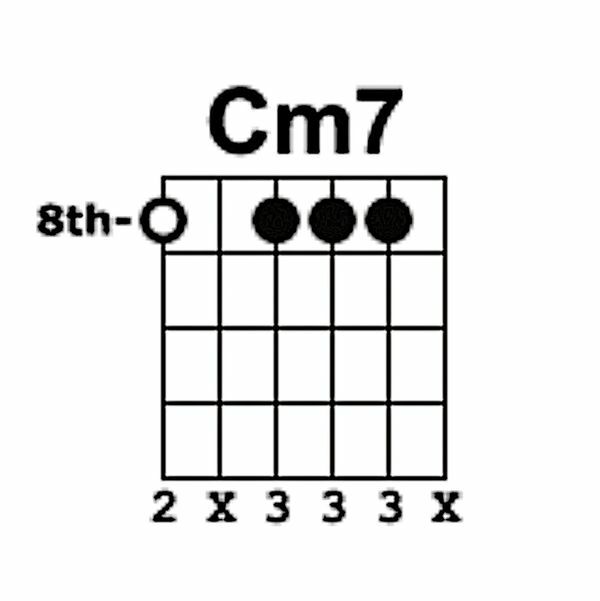 This chord is not a major or minor chord, and is meant to create tension that will later be resolved by other chords. 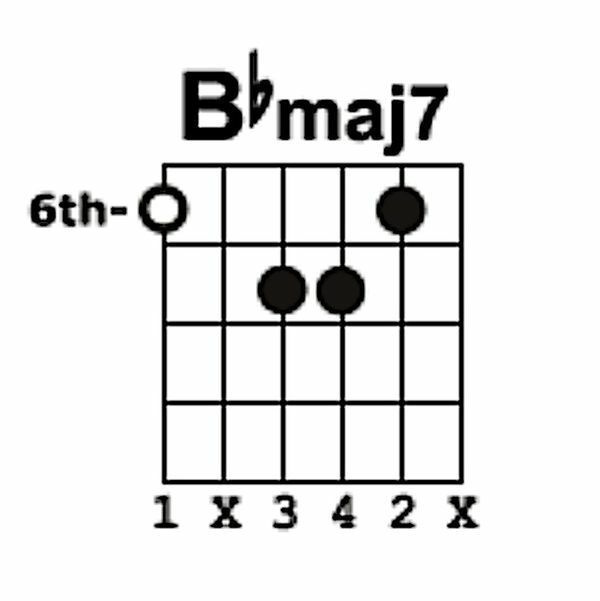 This is the final chord in the chord progression and is known as the tonic or the one chord. The tonic is the chord that releases the tension caused by the F7 chord we played just before this. Notice the note played on the low E string by your first finger is now on the sixth fret of the guitar and not the eighth. It is easiest to put your second finger on the eighth fret of the low E string and bar the eighth fret of the D, G and B strings with your first finger. 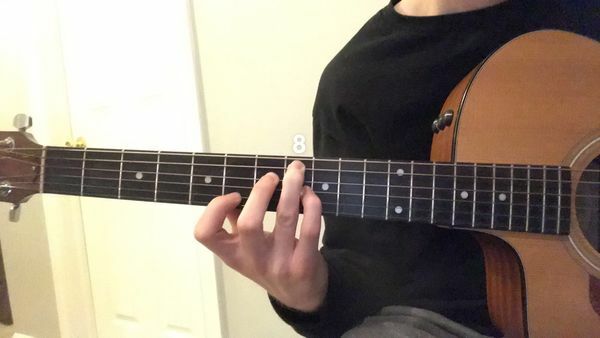 Barring is when you use a single finger to press down on multiple strings at one time and may be difficult until you build greater finger strength. Press your fingers down to the neck of the guitar so that the strings are squished to the neck. Now with your other hand strum every string by brushing with either a guitar pick or your thumb in a downward motion. Be sure that you do not play the open A string or the high E string as these are not notes in the chord. 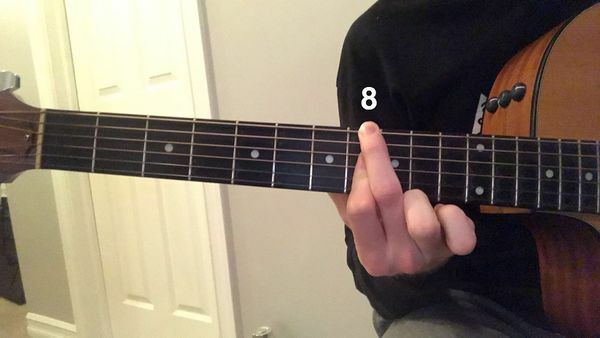 Place your third finger on the eighth fret of the A string. Place your second finger on the seventh fret of the D string. Place your pinky on the eighth fret of the G string and finally place your first finger on the sixth fret of the B string. While brushing the guitar with either a pick or your thumb, be sure not to play the low or high E strings. Place your first finger on the sixth fret of the low E string. Place your third and fourth fingers, respectfully, on the seventh fret of the D and G strings. Place your second finger on the sixth fret of the B string. Brush the strings excluding the A string and high E string. You have now played one of the nicest sounding chord progressions in music. It is best to practice every day, spending at least ten minutes on old things and ten minutes on new things. 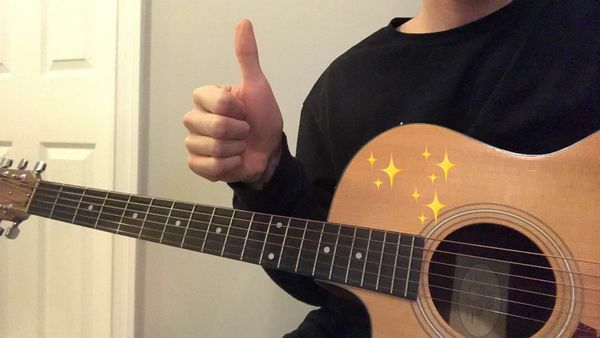 Place your guitar in an area where you spend a lot of downtime so that when you have nothing to do, it will be easy to pick it up and practice without having to put too much thought into it.